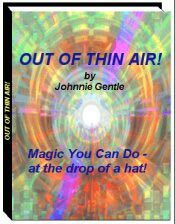 The Magic Touch eBook - "OUT OF THIN AIR"
Produce Real $$$ Dollar Bills for Blank Pieces of Paper and get Cash In a FLASH! to amaze and amuse and bring you lots of fun! Fully explained with detailed pictures - EASY! This Second Magical eBook in the Magic Touch series, reveals the secrets for four tremendous effects that will baffle, amaze and amuse you. These are great magical effects that you will carry with at at all times. You can perform at the bar - at the table - around the fire for a group of friends or for a real live paying audience. - I have always carried these items with me wherever I've gone and have performed them constantly for over 30 years. How Can You Change Blank Paper into Real $$$ Dollar Bills $$$ ? How is it Possible to Produce Real $20 Dollar Bills or £20 Notes FROM THIN AIR? It's All In This "EASY TO FOLLOW" Magical eBOOK - You'll Love it! Most of all - You'll have Great FUN! Download Your copy today and be the 'Life & Soul' of the party! You can now Discover the Secrets of - "OUT OF THIN AIR?" and earn yourself a reputation for being the purveyor of great mystery, fun and laughter and the performer of Great Magic. This eBook brings you Four Great Magical Effects plus other hints and tips. All for the cost of only $27 US (£15) - That's less than $7 US (£4) per effect and includes full instructions for presentation, - with easy to follow photographs. The effects are "Real Practical Magic" - The methods explained have been tried and tested over many years by a professional performer and you won't find better value magic, anywhere!! You can download the eBook NOW and be enjoying the magic in just a few minutes from Now. Better still! - If you order TODAY you can take 25% Discount!! Plus, if you order Today I will include The FREE Magic eBook to have fun with, pass on to your friends or use on your Website! If you order by midnight on , I promise you the FREE MAGIC eBOOK to have fun with and to pass on to your friends. Thank you for Visiting - The Magic Touch - contact us here.